As I’ve mentioned before, I have this really long post about raising livestock in urban areas but I just haven’t posted it. There is a TON of misinformation being spread out there by the animal rights activists about urban livestock. Every time I read another one of their articles or posts – rehashing the exact same misinformation again and again – I want to publish my post. But I don’t. I don’t because I don’t feel the need to defend what I’m doing. As long as my animals are happy and healthy and my neighbors don’t have any problems there’s really no need. I’m not doing anything illegal in my city so why get defensive? But trouble is brewing in Oakland. The animal rights activists are out in force. 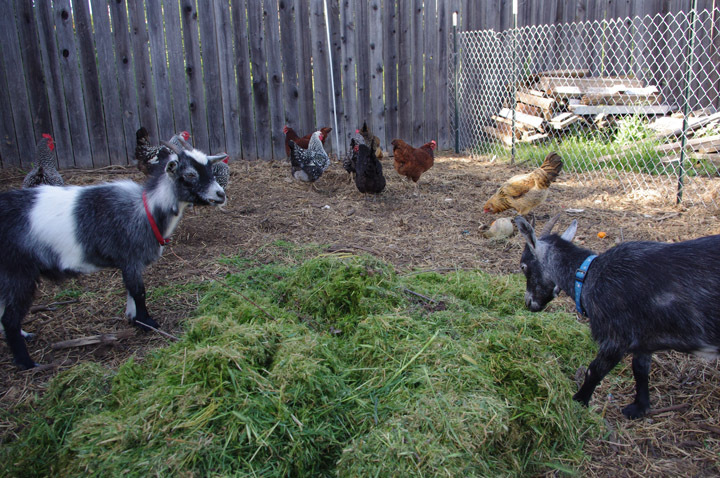 Phase 2 of Oakland’s urban farming code updates are starting and this will involve the keeping of urban livestock. Currently the keeping of livestock in Oakland is perfectly legal. What Oakland is wanting to do is regulate it more than it currently is. This, in my opinion, is a good thing. Regulations should be created to help keep everyone healthy and happy. But the activists want to ban them altogether (yes, including your egg laying hens). They try to get people on their side by misrepresenting the facts and simply telling outright lies. I hope to see you at the workshop! I can't make it in person, but as a former resident of Oakland, I can certainly manage an email. Regulations are fine, and should be encouraged for public healthy and safety, but Cities have a nasty tendency to prohibit activities they don't understand (like beekeeping for example, or growing veggies in your front yard), or that the public doesn't speak up about. I can't stand it when the vocal minority gets their way, just because they make more noise than the rest of us. Time to be LOUD!